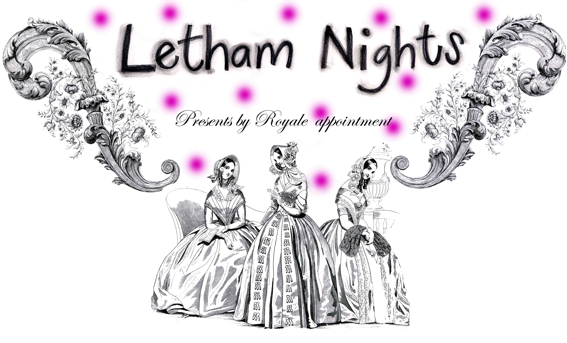 Outcome: The Bevvy Sisters appearing at Letham Nights 11. Sheltering in a tent to avoid the rain we stumbled across The Bevvy Sisters set. Luck was on our side that day because we were blown away by the performers on the stage. The Bevvy’s and their band played with joy, harmony and humour. Brilliant vocals shone through, I can’t think of three voices that were meant to sing together more than Kaela Rowan, Lindsay Black and Heather MacLeod. David Donnelly, guitar and mandolin and James Mackintosh on drums and percussion provided the perfectly judged backing to the sisters. Their incredible musicianship gave a huge soundscape to balance the beautiful vocals. Michael and I approached them after the performance, handed them our card and gave them a wee resume of what Letham Nights is all about. They promised to get in touch as they were booked for the rest of the summer. That suited us as we were also sorted for artists. Subsequent investigation revealed a gathering of fantastic reviews, a CD release, The St James Sessions, recorded (in single takes) at The St James Hall in Innerleithen and then wowing the crowds at this year’s Celtic Connections, pulling huge crowds wherever they played. The e-mail came through and the date was set. Around this time Michael had been contacted by Colin McLean of the Edenists, recommending a young singer songwriter called Kirsty Keatch. She has just back from Manchester after winning the prestigious MIBI songwriters award. Chris Martin from Coldplay awarded her 25 out of 25 and Radio 2’s Mark Radcliffe commented that her song is a “heartbreaking, gorgeous, ethereal pop track”. Kirsty gave us a very impressive and confident show of self-penned songs using her electric guitar and a bank of effects to create loops of soaring melody. She sang her way through Silent Voices, Riddles, Moonbeam, Little Butterflies, Teardrop and the beautiful Dragonfly to name a few. The audience were held in a quiet and reflective mood by these lovely songs and by this future star. If there is any justice in this world Kirsty will be around singing for us for a very long time. 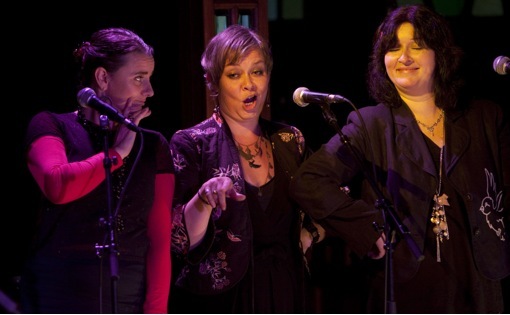 The Bevvy Sisters then graced the stage. There are others who have waxed eloquent about the rich, magical, sweet vocals that flow through swing, jazz, folk and Americana. I cannot add much to what has already been written. Songs from their debut St James Sessions CD were fully represented, amongst them The Littlest Bird, 1000 miles, The Way You Know You Do, Draw the Line and Apocalypse. They also covered the classics, Mary Don’t You Weep, Rock My Soul and Leadbelly’s Cow Cow Yikkey. The Letham Nights crowd were keen to get up and dance and were even tricked into descending onto the dancefloor to a 20 second ad jingle in the style of 50’s American TV! If the Cohen brothers are looking for some tunes for their next film, they should have a listen to The Bevvy Sisters. Each song was greeted with enthusiasm by the Letham Nights full house. There was dancing and audience participation and during the song Smoke, lighters blazed as the song was sung. As we had seen from the gig at the Big Tent, where they are booked to appear again this year, this band are certainly going places, and deservedly so. A straw poll taken at the end of the gig and the results were unanimous…Utterly Fantastic!